Hidden in the woods of the Malheur National Forest, lies a landscape transformed by the monumental efforts of 19th-century gold miners. 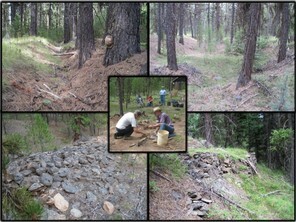 In 2014, the Malheur National Forest Heritage staff and Passport in Time volunteers teamed up to conduct archaeological site testing of a habitation site associated with the immigrant Chinese populations of these gold miners: Happy Camp Mining District. We will build on the success of that project by expanding our investigation area into the surrounding mining features. Passport in Time volunteers will gain experience in systematic survey methods, artifact identification, comprehensive surface inventory, and much more! Join us to learn about the fascinating history of the immigrant Chinese gold miners in the southern Blue Mountains. We hope to see you in July!